*LOCATION*LOCATION*LOCATION* This Home has Panoramic Views of Troon Mountain and Borders NAOS Land. Gorgeous 4 Bedroom Home in Immaculate Condition with 2 Tone Paint on a Cul-De_Sac Lot. This Light and Bright Home with Flowing Floorplan has Walls of Windows, Plantation Shutters and a Split Master Suite with 2 Walk In Closets and Huge Master Bathroon. There is a Formal Living Room and Dining Room Plus a Family Room that Overlooks the Kitchen with Breakfast Bar, Eat In Area, Stainless Steel Appliances, Convection Oven Plus Microwave, Granite Counters, Antique Looking Cabinets with Plenty of Storage and 2 Kitchen Islands. 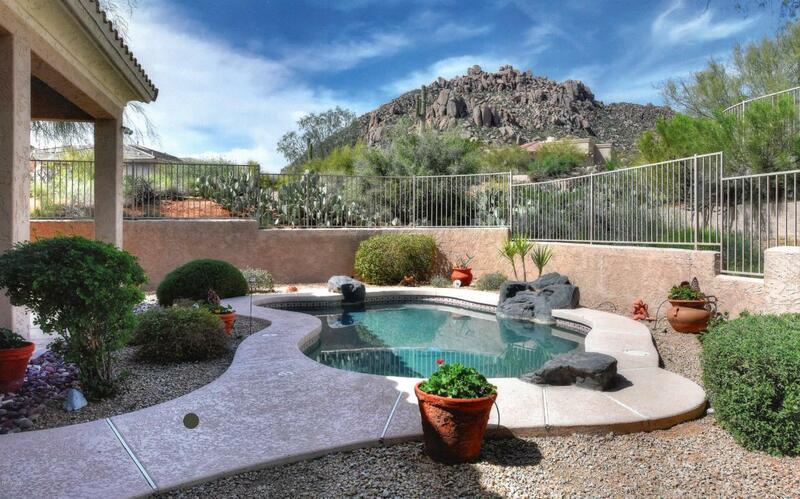 The Backyard with Sparkling PebbleTec Pool, Mature Trees and Covered Patio all Overlook Troon Mountain. Beautiful Location, Gorgeous Home with Great Views.